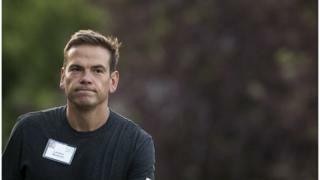 Lachlan Murdoch has moved one step closer to buying television network Channel Ten after Australia's competition regulator gave the green light to the potential acquisition. The News Corp co-chairman is leading a consortium to buy the struggling broadcaster. Australia's media laws would need to be changed for the takeover to proceed. The government has moved to relax the rules which put limits on media ownership. In a statement on Thursday, the Australian Competition and Consumer Commission (ACCC) said the proposed buyout of Channel Ten would not harm competition. "While this transaction will result in some reduction in diversity across the Australian media landscape, we have concluded it would not substantially lessen competition," it said. Proposed changes to media law in Australia would remove the so-called "two out of three" rule, which prevents a single party owning print, radio and television assets in the same market. The laws, which have passed the lower house of parliament but face opposition in the senate, must be changed for the Ten deal to go through. Mr Murdoch owns a radio station and News Corp publishes about two-thirds of the country's newspapers. His buyout partner Bruce Gordon owns regional television licences across Australia. Mr Murdoch is already a shareholder of Ten, which was placed into administration earlier this year. Media owners in the country argue current laws are outdated and hurt their ability to compete for advertising revenues from newer, online players like Facebook and Google. Are the Murdochs too powerful?